Huh? You are just trying to rehash old dreck, what is the yatzer horo to repeat and disseminate old loshon horo? So sorry to brst your bubble but the 'rebetzin' in the photo bears no resemblance to the wife of the Mincas Elazar, daughter of the Komarner Rebbe. They are just innocent bystanders who happened to be sharing the street with the Rebbe and his entourage. Sorry :( better luck next time! you are so "old news"
Q.What do both Tzig and I have in common? A.When we post here we're both talking to the wall. You are linking back to your old aveiros. After reading that thread, I could really use a shower. sorry to burst your bubble Tzig, but that’s not the Rebetzin of the Minchas Elazar, nor does it bear any resemblance. They are just two innocent passerby who happened to be sharing the same street as the Rebbe and his entourage. Do your homework better next time before you build an opinion and bash a gadol based on an assumption. If I were you, I’d own up to it and apologize and delete the post. what are your old sins? is Litvak from magyar from the revolutionary guards keeping tabs on everyones sins? "If I were you, I’d own up to it and apologize and delete the post." on the other hand since he posted it some virtue may come of it, by people commenting here that this photo was not signed by "Getty" photos so to speak, and the implications implied are false. now its known, for those who "want" know. is their a other picture from the (2nd)munkacher rebetzin?
" after munkatcher rov was niftar the chassudim were looking someone like him "
how did the chasdim dare to take someone else? Hirshel probably took a walk with his rebetzin on main street in one of the long summer shabos afternoons, and some drelyak peered on him with his pious eyes.. So he let him know what his rebbe did on dacha. and if it "wasn't" his own rebetzin walking with them, Nu? than it's even worse than Hirshel on main street! Y "why his daughter Frimel picked up his wine goblet"
And why not? do u think Udal the behs"t daughter wouldn't of do such think? my teacher told me once rebbe elimalech in his wandering days an orphaned girl put down a Becker in front of him and he ran out of that house, but not his daughter duh. 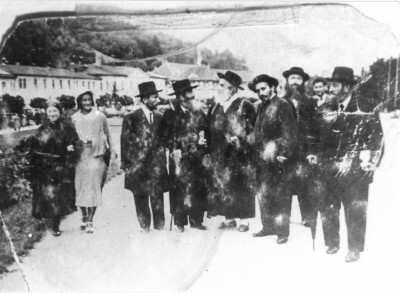 Fact: It is the wife of Reb Mordechai Williger za"l. He is standing to the ME's left, viewer's right, peering into the camera. he's a fiction writer and mixes image gossip and truths which makes him a good writer, but he's in his stomach a "satmarer Talmud" who became a mizrachest but tries to soften the rebbe's image before the rebbe came to EY which he did than in a "journalistic way". he even visited (with a kvitel) the rebbe years latter, and the rebbe quipped with him. "Al kisie loi yieshev zor,"
He must of meant the SR (where most survived became "his" chasidim of..) he didn't mind the kolshizer ruv to be his SIL crotch and to authentic (baby sit) his SIL until the time came and his wishes did came true.. we have now מונקאטש בתפארתה again. ps:don't be so harsh on Munkachers and their rebetzens..